During the recent city elections, voter turn-out was, from all evidence, dismal. Too few people saw fit to exercise their civic responsibility. We won't go into the reasons we suspect were at the root of the record low turn-out at the ballot box here. For mayoral candidate Eric Garcetti, now locked in a run-off with Wendy Greuel, the vote still managed to underscore his status as the front runner. Despite an impressive showing by newcomer Emanuel Pleitez, and a strong following among the city's Latino population for Wendy Greuel, Garcetti won most all of the precincts on the East Side where Latinos were the majority. It probably didn't hurt to have someone like Salma Hayek loving on him so openly in campaign commercials. Mayoral candidate Jan Perry, who terms out this summer as the Council Member from the Ninth District and still has considerable influence among her constituents, has endorsed Garcetti. Greuel, on the other hand, has picked up an endorsement from former President Bill Clinton, a fact unlikely to sway the considerable tide of young professional Latinos—too young to remember Clinton but who came out enthusiastically for Obama—solidly behind Garcetti. Interestingly enough, the Clinton nod came after Garcetti announced his endorsement from Perry. In Perry's former district, Ana Cubas is in a run-off against State Senator Curren Price, who led a field of six candidates with only 27% of the roughly 9,600 votes cast. A former Chief of Staff in the office of District 14's José Huizar, Cubas has support from a broad cross-section of the electorate. The amusing "rrrun-rrun," or rumor, however, is that a Cubas campaign staffer suggested sending sticks of canela—raw cinnamon sticks—to Latino voters in the district as a direct mail gift to reinforce the fact that she herself is fond of café de olla. The drink is a pan-Latino morning perk made by mixing coffee grounds, a cinnamon stick, milk and sugar in a single pot of boiling water. The result is then strained into a cup for a drink so delicious it has gone from being just a Mexican invention to a beverage prepared in Latino homes across the continent. If elected, Cubas will be the first Salvadoran-American to sit on the council. While Ron Gochez trailed all but one of the candidates in that race to finish fifth, his 715 votes would have put Cubas in first place and thus made her the front runner. Gochez ran on a progressive and openly pro-immigrant rights platform of black and brown unity, so it was obviously not an issue of just who was Latino enough. If he, along with last place finisher Manny Aldana, decided to pool their support behind Cubas as Latinos at this stage, one wonder's if might be enough to swing the election her way. And it's doubtful that would ever happen anyway, since Latinos have rarely demonstrated an inclination to support a candidate based solely on perceived mutual ethnicity. Of course, this makes the unrealized cinnamon stunt ironic. 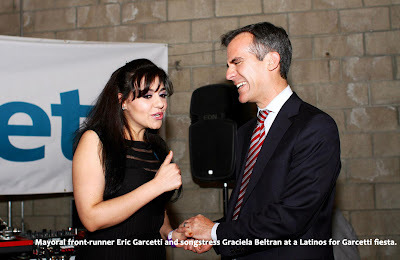 And it makes the suggestions that Garcetti is not truly Latino, because he grew up in the San Fernando Valley an is only half Mexican, even funnier. The Ninth District will, from the looks of it, continue to be represented by an African-American. Whether or not these issues are discussed in conversations about the changing demographics in South Central remain to be seen. From our perspective, the endemic issues of domestic and gang violence, crime, lack of economic opportunity and educational inequality in both the 14th and 9th Districts are common ground around which communities can come together. Solutions to and the mitigation of these age-old social ills should come from those most closely connected to those living and working inside these communities with assistance from allies among government, philanthropic and private sector entities. We should be mindful and wary of those with no roots in those communities who appear with seemingly infinite resources like a magic bullet to assure us they are sincerely interested in helping community advocates continue their long-standing efforts to improve the quality of life for their families and neighbors. Remember the adage. It exists for a reason. Beware of strangers bearing gifts. In light of this, it was interesting to see former mayoral candidate Emanuel Pleitez holding a sign at a rally opposing the demolition of the historic Wyvernwood Garden Apartments by the developers who want to replace the rent-controlled housing units, which now sit on the property they acquired in 1998 as a speculative investment, with a mixed use development that includes zoning changes to allow increased residential density, bars, shops and condos. While he made no references to Wyvernwood in any of the almost daily press advisories released by his campaign during a novel run for the city's highest office, he politely walked alongside the crowd of residents, community activists, Aztec dancers and son jarocho musicians. It was a courageous and unexpected expression of solidarity with their more than reasonable skepticism toward a development which seeks to level the slew of buildings currently occupied by a significant number of families who have called Wyvernwood home for decades. Incidentally, Pleitez has also endorsed Garcetti for Mayor in the run-off. If resident retention was really a priority for the developers, why wouldn't they have simply invested the millions of dollars they have spread around to high priced lobbyists, media strategists, flashy slide shows, blue prints, architects and donations to political candidates as well as community organizations in exchange for support to renovate and restore the site and thus preserve a historic legacy, a prize piece of city's landmark architectural heritage, a place that even the LA Conservancy has argued in favor of preserving? Had they decided to use that money to return Wyvernwood to its original grandeur—which they could have done many times over with what they're prepared to spend on demolition and new construction, the residents living there now would finally have dignified housing. Their children would be proud and happy to come home from school each day to wi-fi and a computer literacy center, and they would take even more pride in their surroundings. They would probably be more inclined to finish their homework, do well in class and thus not become fodder for the prison pipeline. As units became available because of attrition and natural causes, new residents would be willing to pay more for the privilege of living in beautiful, historically valuable homes. It would attract publicity and stimulate interest based on an alternative model of development. The jobs promised by the developer would still be there. It seems to us a much better and less contentious way to empower residents and mitigate the problems the developers point to as the primary reason for their interest in demolishing the apartments to begin with, while still providing the property owner with substantial and significant revenue from rents. The goodwill generated might even make it easier for the developer to get approval on new projects around the city. Call me naive or crazy, but there has to be a way for everyone to win so we can get on with the business of building a better, healthier and more prosperous Boyle Heights alongside the Greater East Side, while making LA a bona fide world class city that honors its history even as it looks to the future.